Hello playmoville: i'm a mexican artist that had been working with playmobil's characters for quite a bit. what i do is basically overpose playmobil's figures over famous paintings such as, la gioconda, las meninas, etc. I'm a brazilian playmobil collector and I'd like to invite everyone to the discussion list in YahooGroups. Just send and e-mail to playmobilforall-subscribe@yahoogroups.com and you're in! Hello, i m glad that i have found your nice pages. i m viko from austria and send greetings to you and all your guest. i have plamo-photo-story pages and i m searching for somebody who can help me with translation into japanese. I've just started 'collecting' playmobil and would like to know of any sites/persons with links, places to buy etc. Great site! Hope to trade. Check out the Yahoo Playmobil Club http://clubs.yahoo.com/clubs/playmobil Keep the faith! Playmobil forever! Thanks again for the site! Congratulations for your site, very nice. I' ll come back several time! Hello, Nice site. I am completely apalled that the playmobilcentral site is being harassed by the German company. It is a wonderful site and needs to survive to help all the playmobil collectors out there. I am a playmobil retailer and we are still selling via the internet. However, you still have to give us a call or fax to order. Please help us to keep "Playmobil Central" on the internet! Write to PLAYMOBIL telling them your concerns on this matter, only together can we save this great web page. 'A DAY THAT WILL LIVE IN INFAMY' Today Playmobil closed down Bart De Smet's excellent collector's site claiming that he needed "permission." Since when do we need "permission" to collect Playmobil? Fine Site! It is such a good feel to realize: I am no alone with my playmomaniac... Have a look at my site. Keep going! 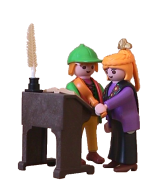 We are one of the few websites left that are selling playmobil in a two stage operation Playmobil has asked us not to do point & click so credit card infomation must be called or faxed in. I just talked to Playmobil and it is true, they are going to release an ultimate catalog featuring every set they have ever offered! They said it should be out around the middle of next year. Wow! Many thanks to Claudia who tell me that page!!! It's great to make a fan site for all the playmobilists. I missed such a long time and I miss that in Germany. This site can be with the help of all the number one of a Playmobil fan site. Hey good website, I have a pretty major collection of the western sets and I plan to build a huge train layout with the town and the Indians and soldiers everything! It is going to take me a while, but when I get it set up maybe I could send in. What a nice surprise. I really tought I was the only one mad enough to host a site about Playmobil. Guess I am proven wrong here. Maybe we can join forces? I'm very curious about how you got started with your site and what your future plans are. It looks like a great start for a much needed Playmobil collectors' site. I'll be watching with interest. Hi there, very nice site. The layout looks good and there's already lots of info. Keep up the good work! I feel a lil bit lost here...but hey, during the last few months I learned (greetings my Queen and my Princess :)) to appreciate the specialness of the different Playmobil themes. Playmobil rules ! Location/Country: USA, but I visit Netherlands!!!!! I want to trade in my Fisher-Price collectables for Playmobile toys. Also Is there a basic house, basic school, other basics of a child's life?